I received few days ago this small RGBW module from Qubino (reference ZMNHWD1) which function is to control multicolor led bulbs or ribbons. I would like to thanks Planete-Domotique for this delivery. Nice to look at, this small object impresses by its small size. It opens the question, how Qubino did it to have all electronics in a so small device. I didn’t want to wait more and opened it. Here is what I discovered. About its size : 40.5 x 32 x 14.5 mm. The picture below compares it to a USB key. 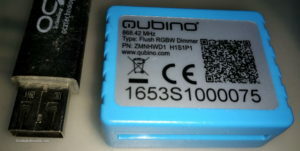 It has a nice looking with its “Qubino” blue color. The white border visible on the top is in fact the wire antenne which is by default located inside a slot of the case. Aesthetic and well done. 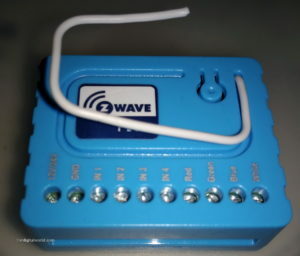 The connector block have many contacts : 10 contacts. Compared to modules connected to mains this is a lot of contacts. 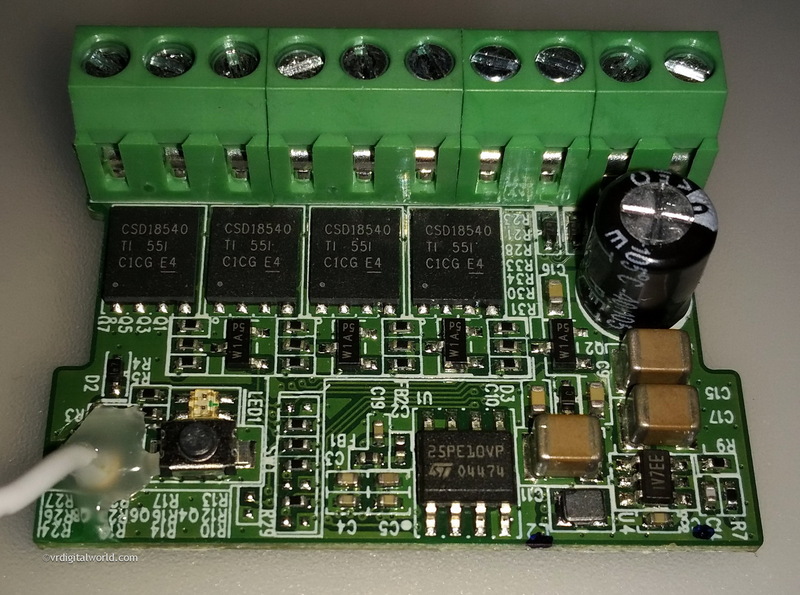 This device’s using low voltage (12V à 24V), security norms are much more important and minimum isolation between contacts is much less restrictive. The case have a simple conception (2 parts fixed by clips) but neat. The label is although not simply done with paper, but a metalized one. It’s going to be still readable in 20 years. 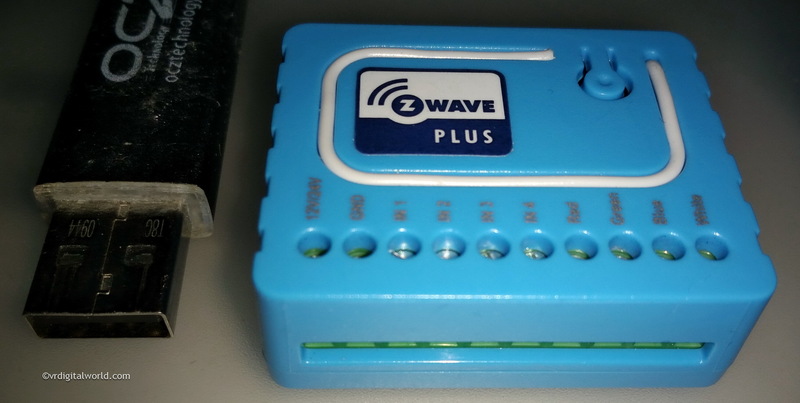 Z-wave + module which includes Zwave link management of cours but also provide part of the power of its microcontroller to manage all functions of the device (inputs/outputs). 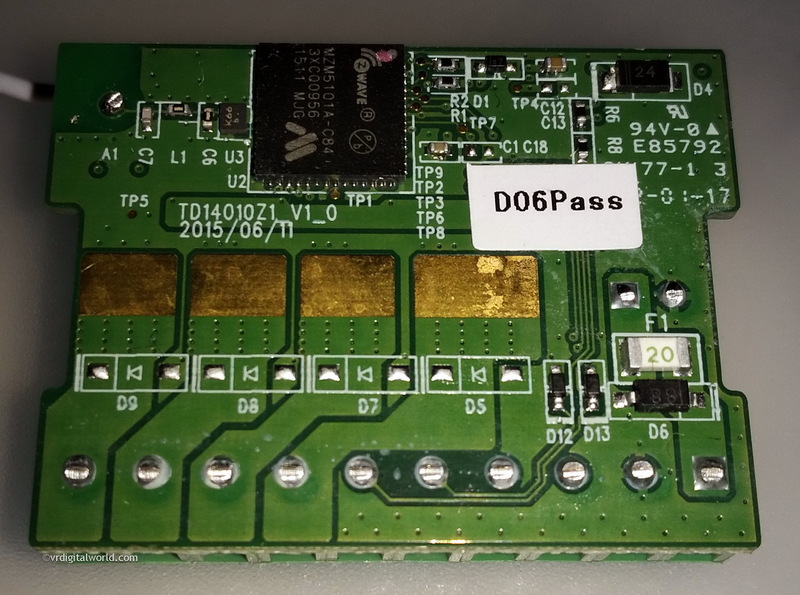 It’s a ZM5101A module. 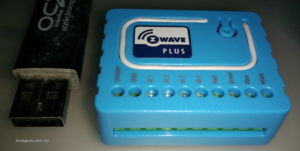 This is the kind of module mostly used on this kind of Zwave+ products. To be noted : protective diodes on the outputs aren’t mounted. It’s not a problem if you use the module for the target function, meaning Led lighting management. 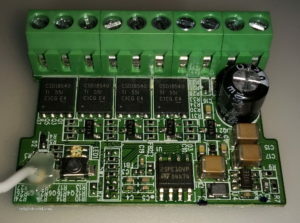 However you may take some care if you want to use the module for other extra functions like controlling 12V or 24V motors. Inductive devices like motores may destroy the output components. power decoupling with a good chemical capacitor (105°C component). 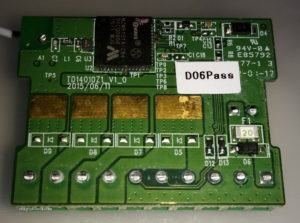 Compacity of the device is then obtained by using components selected with small cases, for instance used inside smartphone products. Components are of good quality. Thermal aspects have been studied carefully. Output transistors are of very low impedance (RDS ON=1,8mohm), enabling low power dissipation as heat then device remains cooler. Heat dissipation may be around 0,300W at maximal current ( 3,25A*4 = 13A). This is a small power to dissipate. Overall this is a modern design without any visible concessions. It’s not the case for every smarthome products. Companies tend to reduce price, and this choice have necessarily an impact on fiability of the device through time. The use of this device in my overall system is going to start, I’m going to try to be original. Stay tuned !